The Korean Demilitarised Zone (DMZ) is a roughly two mile (4km) stretch of demilitarised land that divides the Korean peninsula in two. The DMZ was established in 1953 at the end of the Korean War, remaining not only as one of the most heavily-armed and guarded territories on the planet but also as the last surviving relic of the Cold War. 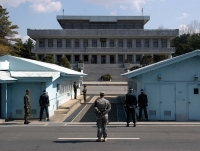 Daytrips which leave from downtown Seoul include guided tours of North Korean infiltration tunnels and the site of negotiations between the warring countries called the Joint Security Area (Panmunjeon). Upon entry, visitors are required to put their signature on an indemnity form acknowledging that they are entering a hostile area, where they face 'the possibility of injury or death as a direct result of enemy action'. Another interesting aspect of the DMZ is that, due to the total absence of development in the area for nearly 65 years, the wider area has become the site of what must be the world's most unlikely wildlife sanctuary. An area of serene and unspoiled beauty, the sanctuary is home to several rare and endangered species, such as Asiatic black bears, Siberian tigers, Amur leopards, and beautiful migratory birds. There are some hotels and hostels in the area for those who want more than just a tour. Transport: Since tours of the DMZ are strictly by reservation only, visitors will need to engage the services of a tour company to visit the site.